NEW YORK (Reuters) – Time on Tuesday named a group of journalists, including a slain Saudi Arabian writer and two Reuters reporters imprisoned by Myanmar’s government, as “Person of the Year” and warned the idea of truth as critical to democracy is under assault. The publication also honoured the founder of a Philippines news website critical of that country’s authoritarian government and a Maryland newspaper that was the target of a mass shooting, the first time in the magazine’s 95-year history that Time has bestowed the distinction on its own profession. 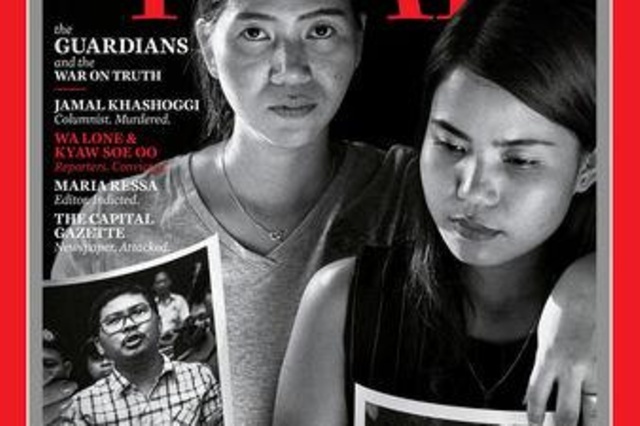 A cover story highlighted the role of journalists, including Reuters’ Wa Lone and Kyaw Soe Oo, who Myanmar imprisoned for violating a state secrets act, and Jamal Khashoggi, a Saudi writer and critic of the nation’s de facto ruler Crown Prince Mohammed bin Salman, who was slain two months ago inside a Saudi Arabian consulate in Turkey. The annual distinction is intended to recognise the person, group or idea that had the greatest influence on world events that year. It has been given to a wide range of influencers, from U.S. civil rights activist Martin Luther King Jr. and Queen Elizabeth to Adolf Hitler, the leader of Nazi Germany, who was honoured before the start of World War Two. Wednesday will mark one year since Reuters journalists Wa Lone, 32, and Kyaw Soe Oo, 28, were imprisoned for their work investigating the killing of villagers from Myanmar’s Muslim Rohingya minority by the country’s security forces and civilian mobs. They were convicted on Sept. 3 under the colonial-era Official Secrets Act in a case seen as a test of democratic freedoms in Myanmar. “We hope this recognition will draw continued awareness to their unjust arrest and imprisonment in Myanmar, and reaffirm the essential role of a free press around the world. Every day that Wa Lone and Kyaw Soe Oo remain in prison is an assault on press freedom,” said Reg Chua, the chief operating officer for Reuters editorial. U.S. senators briefed by the Central Intelligence Agency have said they are certain that the Saudi crown prince was responsible for Khashoggi’s killing, a view U.S. President Donald Trump has said he is sceptical of. The crown prince has denied knowledge of the operation that killed Khashoggi. “Whether they have been denied their freedom or been brutally murdered, honouring their work speaking truth to power is essential at this critical time where reporters are under unprecedented threat across the globe,” said Margaux Ewen, the North America director for Reporters Sans Frontieres, or Reporters Without Borders.